Our wines are classic Bourgogne-style blends of our Dijon clones 113, 114, and 115. Each vintage of is aged for up to 18 months in neutral oak barrels to achieve a well- rounded balance of fruit forward and lingering, spicy pinot finish that is highly expressive of each growing season. See below to learn about our currently available and expected future releases of . As we monitored the development of our 2010 in the bottle from 2011 to 2014, we began to realize that our debut wine was developing into what may be one of the finest pinot noirs ever made in Oregon — or anywhere, for that matter. A jewel of pinot flavors and gorgeous color, the 2010 is elegant, engaging, profoundly satisfying, and truly memorable Oregon pinot noir. Only 50 cases produced, and only a few cases remain for sale on an allocation basis only. Please contact us if you would like to try this extraordinary wine. A cool season wine that is now approaching maturity, with an emergent complex structure that hosts an exquisite spectrum of nuanced fruit and spice flavors. A vintage that can be cellared for many years. 97 cases were produced. A lovely growing season produced a wine that exhibits a spectrum of nuanced pinot fruit flavors, with a hint of citrus on a velvety finish. Cellaring up to 12 years. 93 cases were produced. An expansive wine that is already showing a very promising marriage of pinot flavors, structure, and texture that one would hope to achieve from the nearly ideal 2013 growing season. 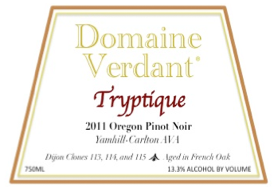 A somewhat more assertive and up-front wine than our cooler season pinots, we believe this wine is destined to become a memorable Oregon pinot noir that will deliver deep pinot flavors for a decade or more. 346 cases were produced. After a nearly ideal 2013 growing season, we did not expect that 2014 could be even better – but it was. There is growing consensus that 2014 may be the best vintage for pinot noir in the nearly 50 years of pinot viticulture in Oregon. The intensity of flavors this wine showed in barrel leads us to believe that 2014 will be a landmark vintage for . We expect to see a bold, engaging, deeply fruitful wine emerge in the bottle. 265 cases were produced.